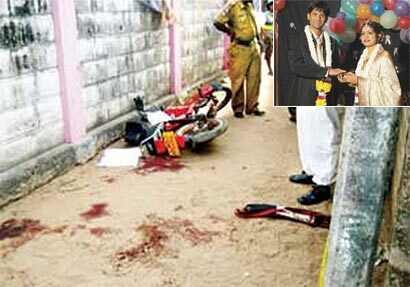 Police investigating the killing of 28-year-old Iswaradasan Kedeshwaran aka ‘Kathee’ in the Trincomalee police division on the night of April 18, 2012 have arrested a pilot and an Air Force deserter. Sources said that the suspects had killed the handsome cricketer on a contract given by his wife, living in the UK. Asked whether the police were in touch with British authorities, sources said that action would be taken to track down the woman and explore the possibility of having her extradited. Air Force headquarters said that the arrested pilot was one of their officers. Police said that the other suspect had been employed in the private sector. Investigators said that the woman had a relationship with the pilot after having first met him in the UK. The pilot had received 1,750 Sterling Pounds from the woman to finance the hit, sources said, adding that the entire sum was transferred to a bank account bearing the name of the mother of the Air Force deserter. In spite of the conclusion of the conflict in May 2009, killings continue in many parts of the country. The government and law enforcement personnel are under heavy flak over their failure to tackle the crime wave, with a section of the Opposition alleging complicity on the part of the government. Iswaradasan Kedeshwaran was found beheaded as he was returning home after having dinner at his wife’s residence. His wife had been in the UK. Kedeshwaran had recently returned from the UK, where he lived with his wife, and joined the Trincomalee Nomads cricket team. His friends told The Island that he was loved by spectators and team mates and was considered one of the key players. Only a tamil can do this sort of cruelty. They kill sinhala buddhists for more than 30 years.